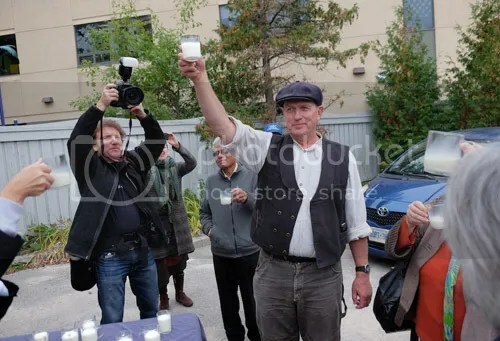 Farmer Michael Schmidt shares a toast with farm share members at last Tuesday’s farm products distribution in Thornhill while a Toronto Sun photographer immortalizes the moment. Speculation is that authorities don’t like Mr. Schmidt’s work for food freedom, but have taken to using indirect measures such as the theft charge described in this story to try to shut him down. “Durham-area raw milk farmer Michael Schmidt is facing theft and mischief charges in connection with cameras that were found along the road near his farm. Schmidt, 61, has been charged with theft under $5,000 and mischief in relation to two cameras belonging to the Ministry of Natural Resources and Forestry that had been placed along Conc. 2 near his farm. He is scheduled to appear in court in Walkerton on Oct. 26. Schmidt said he was notified by West Grey Police on Thursday afternoon that he had been charged and he plans to fight the charges. More in the Owen Sound Sun Times. Sadly, when you are foolish enough to give government much power, they will use it to subjugate you.